The best ways to earn experience and level up your characters in Apex Legends. In Apex Legends, there are a variety of ways to earn XP in order to level up fast. Note that while your profile level remains static regardless of which characters you play, your stats like kills earned are tied directly to each character. For example, if you have 40 kills with Bangalore, those 40 kills won’t display when playing Wraith and vice versa. For more information on tracking stats in Apex Legends, be sure to check out our previous guide. As you level up in Apex Legends, you’ll earn Apex Packs which contain random cosmetic items for your characters and weapons. You’ll also earn Legend Tokens which can be used to unlock new Legends like Octane, Caustic and Mirage. Struggling to earn experience and level up in Apex Legends? We’ve got you covered! Below, we’ve put together a full guide on how to earn XP and level up fast in Apex Legends, and also added details on levelling up the Season 1 Battle Pass! 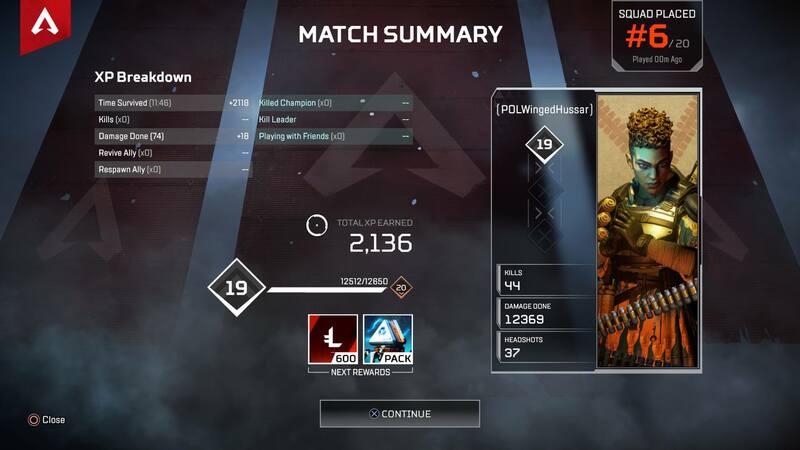 At the end of each match, you can view a summary of your performance and a breakdown of the XP you earned in Apex Legends. To level up in Apex Legends, you’ll need to earn experience points or XP. There are a variety of different ways to earn XP in Apex Legends from reviving teammates to killing enemies. Because your performance will vary from match to match, you shouldn’t rely on kills alone if you want to level up fast in Apex Legends. Instead, you’ll want to factor in other things like hunting down the Champion and surviving as long as possible. To help make things a little less confusing, we’ve listed all of the ways in which you can earn XP in Apex Legends and how much total XP is awarded for each down below. Keeping all of these things in mind, a great way to earn XP fast is by playing in a party with friends as you’re granted a +5% bonus to Survival Time XP. Not only does Time Survived reward a solid amount of XP on its own, playing with friends can also help you survive longer as you’re better able to strategize with people you know as opposed to random players. Having a mic equipped is strongly recommended regardless of whether you’re playing with friends or not. If you don’t have a mic or don’t wish to use one, try to familiarize yourself with the ping system in order to communicate and coordinate with your teammates. The more you work together, the longer you’ll be able to survive and the more XP you’ll earn. Playing in a party with your friends grants you a + 5 XP bonus to Survival Time XP in Apex Legends. Plus, reviving and respawning your allies also rewards a fair amount of XP. Another great way to earn XP is by hunting down the Champion as successful Champion kills award a 500 XP bonus in Apex Legends. If you fail to hunt down the Champion, you can also earn XP by killing the current Kill Leader though Kill Leader eliminations will only grant you a 50 XP bonus. To maximize the XP earned each match, you’ll want to try and hit as many different XP factors as you can from dealing damage to killing enemies to surviving as long as you possibly can. In doing so, you should be able to level up your profile fast, earning you Apex Packs and Legend Tokens. The most lucrative XP method is simply survival time, followed by ending in the top 3. Again, keep in mind that your stats like kills earned or damage done remain tied to the character you earned them with meaning that if you have over 100,000 damage done as Bangalore, that number won’t display when playing as Gibraltar or Lifeline. Meanwhile, player level will remain the same regardless of which Legend you play. At certain levels in the pass you'll unlock XP boosters that stack, adding onto the XP you gain from survival time. These are permanent bonuses that will grant you extra XP for your survival time, making staying alive during matches even more lucrative. Along with a 500XP bonus for your first kill of the game, the Season 1 Battle Pass offers an additional 500XP for your first kill each day with every Legend. To take advantage of this, try to swap Legend each match. That's the same XP as being the Champion, so well worth collecting each day. The Season 1 Battle Pass also offers a weekly bonus of up to 25,000XP for every Legend each week. All you need to do is play as that Legend and earn XP as normal. This is visible on the top right of the main screen, so if you max out on one Legend, move on to another to keep claiming that bonus! You can also purchase additional levels to the Battle Pass if you're really desperate, but the we haven't been overawed by the skins in Season 1, so wouldn't recommend splashing out too much cash. 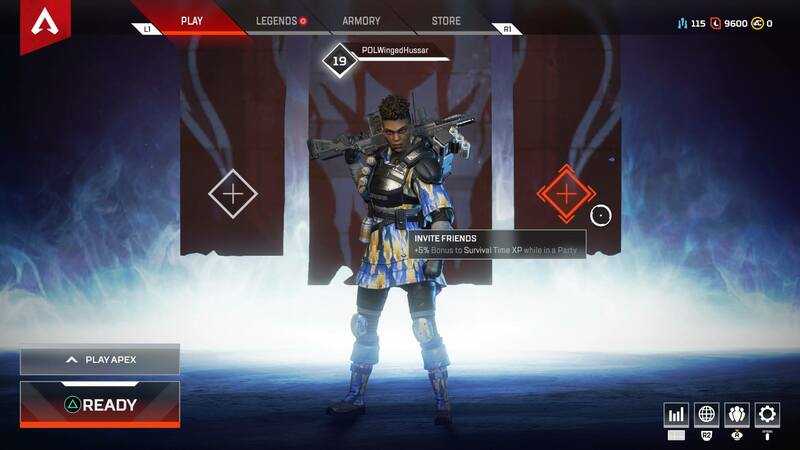 After reviewing the ways in which you can earn XP and level up in Apex Legends, what approach do you feel is the best? Are you someone who hunts down the Champion for 500 bonus XP, or do you prefer playing with friends and surviving as long as you can? Let us know down in the comments below! Apex Legends is free-to-play and available on PC via Origin, Xbox One, and PlayStation 4. For more on Apex Legends, be sure to check out some of our previous guides including how to play Octane in Apex Legends, all item and armor stats in Apex Legends, and how to fix the party not ready error in Apex Legends.